RUN-UP TO GE14: Will the sun set on PAS in the land of the moon? Weeks before the 11th general election in 2004, I attended a briefing by Umno bigwigs, a number of whom were from Kelantan. After it ended, political talk continued even as everyone was enjoying their refreshments. Two senior Umno leaders, making small talk, admitted that despite Umno’s bravado, it could never win back Kelantan as long as “the old man was there”. The old man was, of course, Datuk Nik Aziz Nik Mat, then menteri besar of Kelantan and Mursyidul Am (spiritual leader) of PAS. True enough, in the general election that year, BN recorded its best-ever performance, but Kelantan remained under PAS rule. It is election year again, and Nik Aziz is no more. Umno senses victory and Kelantan, they say, is ripe for the picking. The reason? The Kelantan government under Datuk Ahmad Yakob is seen as shaky, at least in the eyes of Umno. Also, the 67-year-old menteri besar is said to lack the charisma of the late Nik Aziz. Then there is the problem of the economy. That’s one area where Kelantan is not in the best shape. Umno has gone to town with it (in fact, it has been doing that for years), promising better things if the people give it the mandate to rule the state. However, Kelantan has always been laid back, economically that is. Hence, that line of campaigning is nothing new. Still, Umno is saying economic growth has declined further and the people “cannot take it anymore”. The party has not failed to “remind” all and sundry that the lack of job opportunities has forced “hordes” of young people to leave the state. But then, this has always been the scenario in Kelantan. Leaving for greener pastures — including Singapore to work in the construction sector — is “normal” and has been the practice for ages. They leave the state, send money home, and come back for Hari Raya, and yes, pilihan raya. In the elections, they tend to vote PAS back into power, showing a preference for a laid-back lifestyle as long as religious values are given top priority. However, Umno is saying it is different now, going back to the line that “the people can’t take it anymore”, although religion is still very close to the hearts of Kelantan folk. Yes, says political writer and long-time PAS watcher Mohd Sayuti Omar. “Before this, Kelantanese did not care much about economic issues. They gave priority to religion,” he tells The Edge weekly. “Of late, such perceptions have changed. More people are now aware of the role of politics in exploiting religion for power. “This is all about a change of the mindset and attitude of the people,” he observes. The Kelantanese whom The Straits Times spoke to recently reflect this thinking. The ordinary folk who were interviewed said they were “beginning to question their political convictions that have long leaned towards religious sentiments at the expense of economic development”. That’s what was published by the Singapore paper in a special report on the state. Prime Minister Datuk Seri Najib Razak rubbed it in when he told a gathering in Kelantan a few weeks ago that the PAS-led state government “cannot even pay the salaries of its civil servants without the financial aid of Putrajaya”. That was a sledgehammer jibe, but the state government and PAS’ national leadership somehow seem to have taken Najib’s blistering words rather well. And the apparent cordial ties with Umno, remain, well, “cordial”. Najib’s “exposé” of financial aid to the Kelantan government was seen by many in Umno and PAS as paving the way for a cooperation of sorts (read: electoral pact) between the two parties. Now, here lies the problem. It is said that while Umno wants a pact with PAS in the 14th general election to draw Malay support — which, needless to say, is crucial — Umno’s big guns in Kelantan are thinking something else as far as their state is concerned. They want to take on PAS as they feel Umno is in the best position to wrest power. Why make a deal, be subject to terms and conditions, and share the cake when they can have it all? That seems to be the logic. Sources tell The Edge weekly that, on the sidelines of last year’s Umno general assembly, a meeting was held at the Kuala Lumpur residence of Tengku Razaleigh Hamzah, attended by party leaders from Kelantan, including Datuk Mustapa Mohamed. The guest of honour was Najib himself. The agenda, supposedly, was Umno-PAS cooperation. But Umno can’t have a two-phase agreement — on the one hand, cooperating at the national level, and on the other, fighting over Kelantan. However, this meeting and its agenda cannot be independently verified. As for PAS, a pact with Umno could be a self-inflicted blow. According to political analyst Norshahril Saat, if voters perceive that PAS has struck a deal with Umno, it “could sway their support against the party in Kelantan in GE14”. His views were reported by Singapore think tank ISEAS-Yusof Ishak Institute, and picked up by news portal Malaysiakini. PAS has made it clear that it prefers to go it alone, he observes. That would suggest that it “seems sensitive to sentiments on the ground, which are against a formal merger with Umno”. Some grassroots PAS members who spoke to The Edge weekly are still bitter at being “betrayed” by Umno in the late 1970s when PAS was kicked out of the BN coalition that it joined in 1974. However, Norshahril notes that while PAS says it wants to face GE14 on its own, “yet, it is less critical of Umno than of Pakatan Harapan”. According to Sayuti, “it’s all tactical”. “I believe that if PAS cannot get the majority vote, it will merge with Umno after GE14,” he tells The Edge weekly. If what Sayuti says does indeed happen, then we will see a coalition government in Kelantan, or what is known as “UG” or unity government, a term coined by a certain faction in PAS as far back as 2013. Some say such talk started much earlier. The irony of it all is that the pro-UG faction is said to include Nik Abduh, son of Nik Aziz, who remained adamant against any cooperation with Umno up till his death in 2015. Based on current developments though, three-cornered fights in GE14 — between PAS, BN and PH — as Sayuti sees it, are imminent. “In some areas, there’ll probably be independent candidates joining the fray, especially in the event that Pakatan component parties are not happy with the seat allocations,” he says. The main battlefront, according to Sayuti, will nevertheless see three-cornered fights that PAS has a very slim chance of winning. “On paper, the PAS government will fall,” he says. And the winner? “Umno/BN” was his unhesitating reply. A bold prediction, which may be difficult to agree or disagree with. 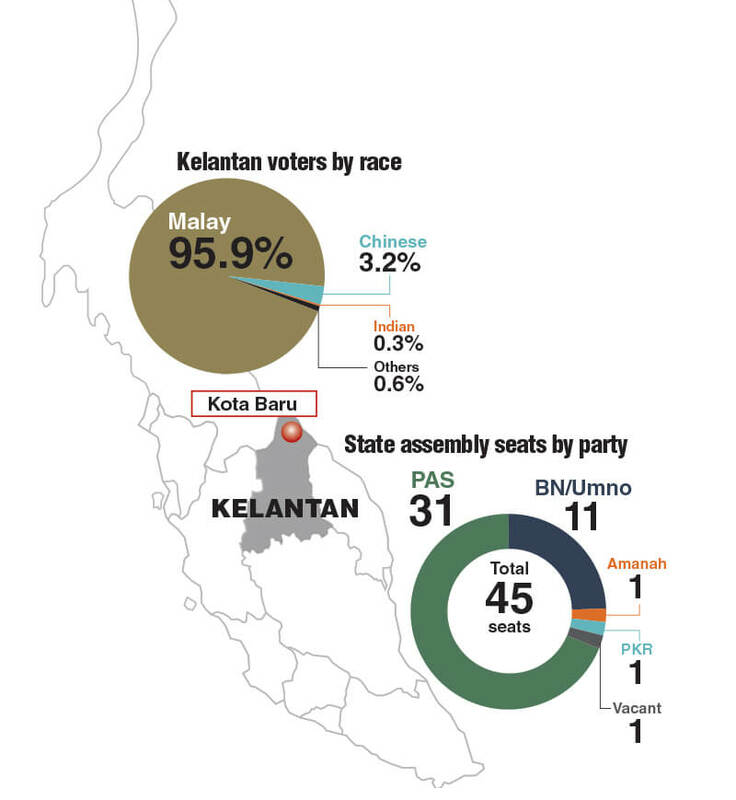 But this much can be said: PAS is losing its grip on Kelantan.